Our goal is to provide the children a balanced diet that satisfies all the nutritional requirements of growing children. As much as possible local ingredients are used to prepare meals that are traditional dishes of Burkina Faso while complementing them with meat, fish and vegetables. Corn, sorghum and millet comprise 85-90% of the base diet of Burkina Faso’s population (almost 100% in rural areas). More and more, rice is becoming one of the base ingredients for many people, especially those living in cities. It is with these grains that most of the traditional dishes of the country are made, accompanied by spicy sauces and, in more well off families, a bit of meat, fish or vegetables. The healthcare system in Burkina Faso is very basic, is not free, and medications are not subsidized. This means that the cost of healthcare for an individual can be very high at times. We provide the children in the Home with the available vaccines against the most common illnesses (meningitis, typhoid fever). The most common health issues affecting children in the Home are minor injuries or dental problems, malaria, cough & cold, skin and stomach problems – we are easily able to deal with those. More difficult to deal with are the occasional cases of depression, attention deficit hyperactivity disorder (ADHD), or more serious illnesses/conditions. In those cases, additional funding for specialist treatment (when available locally) is sometimes sought from the REPT Board of Directors. 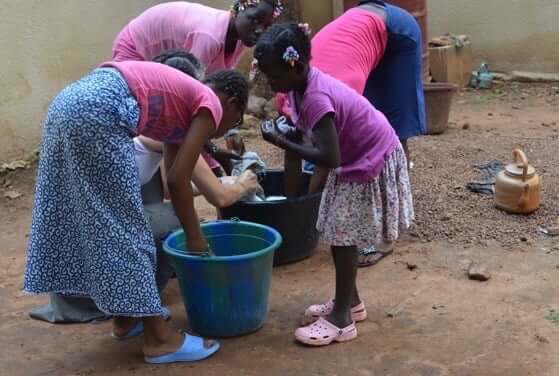 The children all receive a proper education on the importance of personal hygiene & making safe, healthy choices in life – this is usually provided through collaboration with other institutions and qualified volunteers. The Souman Nafaman Directrice regularly inspects and consistently follows up on the general cleanliness of the Home and the personal hygiene of the children in her care.